The Lister Jaguar Stirling Moss is a handcrafted exact recreation of the super lightweight Lister Jaguar Knobbly that led Stirling Moss to victory at Silverstone on 19th July 1958. Silverstone 1958 was the second time Sir Stirling Moss raced for Lister and was his 414th race. Behind the wheel of a super lightweight Lister Jaguar Knobbly, complete with magnesium body and lightweight chassis. With this unbeatable car and driver combination victory at Silverstone was assured. The 1950 British Grand Prix at Silverstone was the first race in the newly created Formula One World Championship. The race rotated between Silverstone, Aintree and Brands Hatch from 1955 to 1986, but relocated permanently to Silverstone in 1987. Silverstone was first used for motor sport by an ad hoc group of friends who set up an impromptu race in September 1947. In 1958, the Lister works team was locked in an intense battle with works cars from Aston Martin, Jaguar, Ferrari, Lotus and customer Listers run by Scottish racing team Ecurie Ecosse. Tragedy struck in May that year when Brian Lister’s much-loved star driver, Archie Scott Brown, crashed at Spa and died later from his injuries. Overcome with grief, Brian Lister initially wanted to leave the sport, but realising he had customer commitments, continued and kept Lister racing. 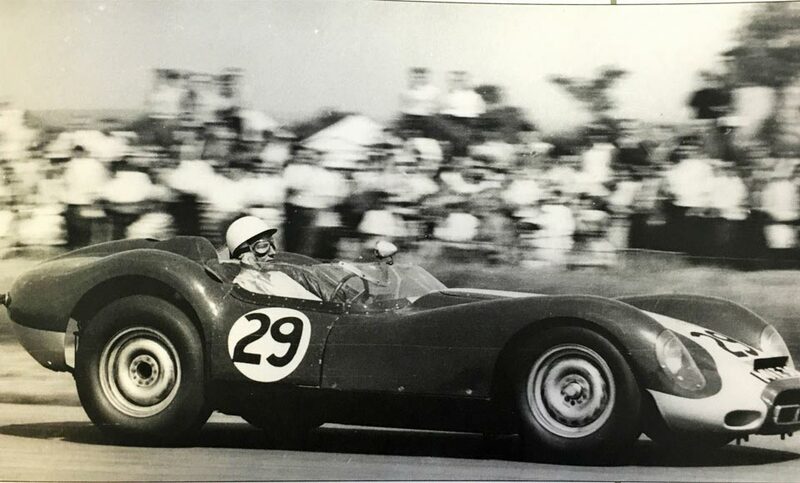 s Keen for a victory at the sports car race of the British Grand Prix round at Silverstone on 19th July, Brian Lister employed the services of Stirling Moss, who was racing for Vanwall in the F1 world championship. Moss took pole in the magnesium-bodied Lister, which wore the famous number plate ‘MVE 303’ and, against a field that included Roy Salvadori and Graham Hill, took victory at an average speed of 97.92mph. Sir Stirling Moss stated in his biography My Racing Life, “Archie Scott Brown used to get astonishing lap times out of the light and sweet-handling Lister-Jaguars. Two months after his tragic death at Spa in May 1958 Brian Lister asked me to handle his car, wearing the famous Cambridge registration MVE 303, in the British Grand Prix support race. I liked it very much, and had a start-to-finish win. My pole position time was 1m 44s, which would have put me on the fifth row of the grid for the Grand Prix that afternoon. Sir Stirling Moss recently said: “The Knobbly remains one of my favourite racing cars. I remember getting into it in 1958 and thinking ‘who is going to beat me in this?’ At the time I knew they were quick but I never realised, until now, that they were so different to the customer cars”.